When creating a blog or a website, it goes without saying that you will want to choose a high-quality web hosting service provider; you want a reliable host that will be able to not only give you enough features, but also offer quality support when needed. 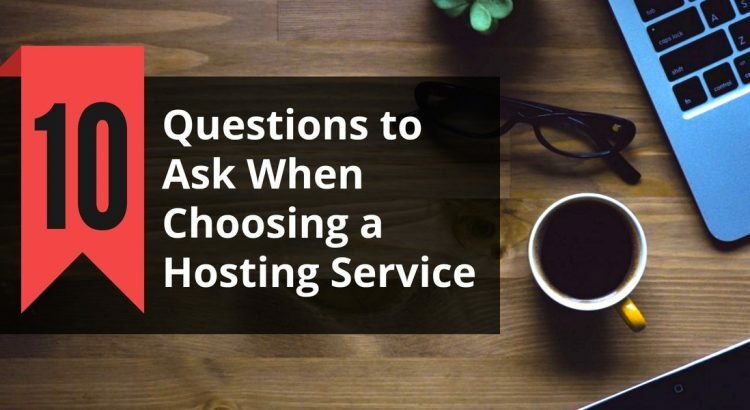 Here are some questions that will help you find and determine, if a specific web hosting service is the right one for you. Let’s get started. 1. Do you have a security policy, and if so, what does it include? Shared hosting is one of the most affordable options for web hosting, and if you are going for a shared host, you would want to know if there are security policies in place. You need to know whether your information and files will be properly protected; even with the more expensive dedicated or cloud hosting services, you want to work with a host that will conjoin with your efforts for security. Good web hosts perform virus and malware scans daily or every other day. If you choose a VPS, you are completely in charge of your virtual server, even though you are not the only client on the host server; you are fully isolated from other people’s virtual servers, just as how their virtual servers are fully isolated from yours. If you opt for dedicated hosting, all security is once again run by you, with the difference between this and virtual servers being that you are the only client on the entire server. 2. Do you offer TLS? SSL, short for Secure Sockets Layer, is a protocol for the encryption of information sent over the Internet. It is a most popular choice for web encryption, making it the best choice for maintaining privacy of your information. If you are building an e-commerce site or anything that requires and processes sensitive information, you will want to work with a web host that can provide you with a good SSL certificate. Before signing up for the service, make sure the web host offers SSL, which will cover all your bases when it comes to security. In the case that your web host does not offer this, you can always get a third-party SSL provider for your website. 3. What kind of uptime can I expect from your servers? 4. Do you perform backups? Ideally, backing up data should be done as often as possible. If backups are made less often, you run a greater risk of losing critical data due to the most recent backup being older than the data that you lost. Avoid signing up with a web host that cannot perform backups of your files at least once a day. 5. What can you do when there is an outage? A good web host will take responsibility for downtimes and outages, even when the circumstances are out of their control. You also need to know if they can help you recover your data in uncontrollable events such as power outages or weather disturbances. Some web hosts suspend their charges during emergencies to ensure that their customers are not being unfairly charged for service that is out-of-order. 6. Can I easily scale up when I need to? In the event that you require more bandwidth, storage, RAM, or CPU power, a good web host should be able to easily accommodate your needs. However, some web hosts can trap their customers in some pretty inflexible contracts, so it’s good practice to check if the hosting company allows for upscaling in resources such as bandwidth and storage space. 7. Are your customer service and tech support teams helpful? Good web hosts maintain equally good customer service and tech support teams that can respond quickly and diligently to your queries and difficulties. 8. Can you accommodate my needs, especially if they change over time? A good web host should be able to easily accommodate you and your needs as they change over the course of your contract with them. 9. Do you monitor security? Good web hosts have the ability to catch if a site is compromised as soon as it happens. Make sure that your web host has security measures in place, such as malware/virus scanners as well as firewalls. 10. What if I’m not satisfied with your service? Web hosting companies that are confident in providing good service to their customers are not afraid to make guarantees or offer refunds in the event that there is a lapse in their service. If you search for a web hosting provider by using the questions above, it’s more than likely that you will find a provider that will be able to provide you with excellent service and support, that also allows you to expand and upgrade your service with ease. PS. If you liked this post, please share it with your friends through social networks by using the buttons below, or simply leave a reply below. Thanks! I’ve been looking for some shared web hosting options, and I think that some tips would be great. I’m glad you talked about how you can easily scale up, which I think would be good. I’m going to have to look for some good shared web hosting plans and see what we can find!